Saint Edith Stein (October 12, 1891 – August 9, 1942) was born into an observant Jewish family at Breslau, but became an atheist by her teenage years. Through her passionate study of philosophy she searched after truth and found it in reading the autobiography of St Teresa of Jesus. 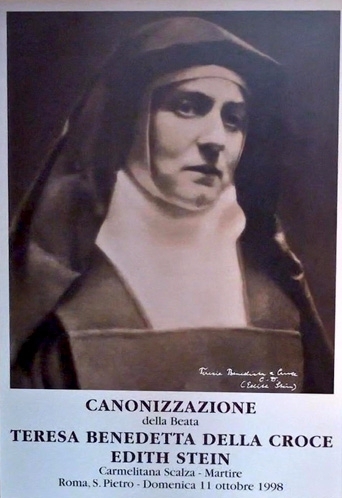 She converted to Christianity and in 1922 she was baptised a Catholic and in 1933 she entered the Carmel of Cologne where she took the name Teresa Benedicta of the Cross. Although she moved from Germany to the Netherlands to avoid Nazi persecution, in 1942 she was arrested and sent to the Auschwitz concentration camp, where she died in the gas chamber. A woman of singular intelligence and learning, she left behind a body of writing notable for its doctrinal richness and profound spirituality. Stein was canonized as Saint Teresa Benedicta of the Cross (her Carmelite monastic name) by Pope John Paul II in 1998; however, she is still often referred to, and churches named for her as, "Saint Edith Stein".